A former Tamil militant in Sri Lanka has admitted that his comrades killed more than 600 policemen 20 years ago in a part of the country he controlled. But, he said, he was in a different part of Sri Lanka at the time. 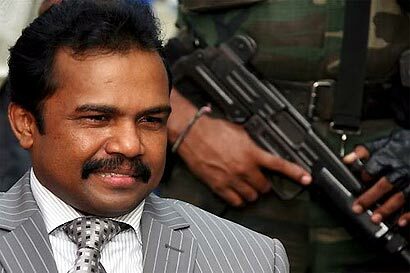 Vinayagamoorthy Muralitharan, commonly known as Colonel Karuna Amman, was testifying before a commission looking into the Sri Lankan war. Col Karuna’s defection from the Tamil Tigers six years ago is seen as having led to their military defeat in 2009. Now a vice-president of Sri Lanka’s governing party, he has been dogged by allegations that he has abused human rights. He has now told the country’s war commission that more than 600 policemen were indeed killed in eastern Sri Lanka when he headed the Tamil Tigers there, something some earlier witnesses had alleged. But Col Karuna said he was then in Jaffna in the north. He said that the Tamil Tiger leader Prabhakaran – along with the rebels’ intelligence chief – were to blame, as they had abducted the police officers, who were never heard of again. The former Tiger said he joined the militants as a teenager and had received training in India during the time of Prime Minister Indira Gandhi. Ironically, the Tigers later assassinated her son, Rajiv. He said this was a “big mistake” but added that Indian peackeeping troops sent to the island by Mr Gandhi when he was prime minister had killed many Sri Lankan Tamils and raped many women; he implied that one such woman was used as the suicide bomber who killed Mr Gandhi. Col Karuna, like other Sri Lankan government members, dismissed the idea that government forces should face war crimes charges. He said the Tigers, his former comrades, had used 300,000 Tamil civilians as a human shield against the state military, and that the latter’s military campaign was necessary in order to release them. Col Karuna also contradicted comments he made in an interview in 2006 about the relationship between Norway – the country which brokered an ill-fated ceasefire which lasted four years from 2002 – and the Tamil Tigers. In that interview he was quoted as saying the Tigers were giving money to the main Norwegian diplomat involved, Erik Solheim, to bribe him. He did however maintain that Oslo had given the rebels financial assistance at the time of the truce. Karuna does not want to accept his killings. He try to nevigate from the charges. The genocidal, barbarous murders of the 600 STF officers who surrendered to the LTTE on the orders of R Premadasa, another traitor, was committed on the orders of VP, in Batticaloa. Karuna, however, cannot easily wash his hands-off the blood of this war crime, by saying he was in the North at the time, because he was LTTE commander based in the Batticaloa. The order was carried out by the cadres under his command. So the order has to come from him also. However, had he failed to carry out the order, which came from VP, he would have been killed himself by the mad war criminal VP, as an act of rebellion. Under Hitler, many such war crimes were committed by underlings on the orders of Hitler, through field commanders. The war criminal is therefore Hitler and not the officers who carried out the orders. If they failed to carryout Hitler’s orders they would have been shot themselves for rebellion. Such is the brutality of war! Officers who carry out orders under duress for fear of being killed themselves cannot be condemned as war criminals. Hence, we cannot condemn Karuna Amman. Karuna Amman is today forgiven for this reason, and also because he eventually broke-away courageously with his cadres in the East from the iron grip of VP, and lent support to the SL defence forces to utterly defeat the evil LTTE, to liberate the Tamil civilians held hostage as a human shield by VP. Karuna and Pillayan were utterly sick of the mad war criminal VP and his side-kick Pottu Amman, for their wanton genocides of Sinhalese and Muslims, conscription of child soldiers, and the scourge of his very own Tamil community by VP in pursuit of his pipe-dream of Tamil ‘eelam’, with the support of Norway and the imperial West for vested interests. We must therefore not be hard on Karuna Amman but be forgiving, along Buddhist dhamma, especially since Karuna redeemed himself by the excellent service he provided to effect the total defeat of the LTTE. he has a major role to play today, within the government, to help re-build the Tamil provinces from the devastation caused by the LTTE brutality in the 30 years of the conflict. So our hats off to Karuna Amman! It is R.Premadasa who ordered to surreder all these police officers to Tamil tigers. The person who became the president of Sri Lanka by chance but not by an educational back ground. Now his son is in politics and trying to becomea high figure in Sri Lanka. People who has a real mind who did not forget about the past, should not give an opportunity for these people to come to the politics of Sri Lanka. Because there is a saying “THE FATHER LIKE SON”. By nature these people never can be changed. When his father was President, SP went around the country enjoying life like a ‘jack the lad’. What service did he render to the rural poor? I hope Namal does a better job and render real service to the rural poor, by setting a good example to the senior ministers and MPs, without much thamasha, to deliver the promises made to the rural poor during election times. I remember SP was known as ‘nidan hora’, as ancient archeaological sites and temples were vandalised in search of treasure. The police dared not lift a finger against him for fear of repercussions from the father. What faith can you put on such a man to lead the country one day to a better future? My money is on Namal that he will do a better job of real work to help the rural poor, instead of showmanship and eyewash. Hon Karuna was a close confidante, associate and a favoured commander of the Sun God. He has admitted crimes agianst the sinhala population, notably in the 6oo PC incident and in the Dalada Maligawa incident. In the concluding stages of the “War” if the Dharaneeshwara Kalyani’s genocidal forces opted to summarily execute combatant and non-combatant members of the LTTE. Cannot understand the double standards in giving this guy a Cabinet Portfolio. There is another tamil person in the Cabinet wanted in India for murder. This person was also denied a visa to the UK to accompany the Dharaneeswara Kalyani in the recent disastrous visit. The noose is tightening around the neck of the pariah state. The report of the UNSG panel due early in 2011 will be the last nail in its coffin. The fun and games which began in London will soon be amplified. The ‘fun and games’ DC speaks of was a trap to arrest MR and some army officer who accompanied MR on his recent trip to UK. MR said, “Veni vidi vicit” and returned home unscathed. Diaspora LTTE and DC had to eat humble pie. The trap was set-up by diaspora LTTE in connivance with the British government and Norway using Oxford Union address as the bait. No doubt, there are some traitors who have crept into government ranks as close advisers, who are in the pay of diaspora LTTE. Today, the diaspora LTTE are not spending their vast piles of money, squeezed out of the ignorant Tamils abroad, to purchase weapons but in buying traitors from within the government ranks who are close to the President. Their vetti will be removed in due course to be tied to a palm tree in Jaffna with their plonkers dipped in a dimi gotta and beaten-up by the SL Tamils, who want to be left alone to enjoy the dawn of a new chapter in their history, the dawn of a golden age for all SL citizens, Sinhalese, Tamils and Muslims. Karuna Amman saw the light eventually to join government ranks, when he bravely defied with Pillayan, the madman and psychopath VP who was the worst war criminal in recent history. He with his cadres lent support to destroy VP, the scourge of the SL Tamils, in order to liberate them. VP, the war criminal, lived in constant fear for his life in a hole in the ground like a rat, for 30 years. He surfaced with his brood to try to flee, with the help of the imperial West, but was given the coup de grace by the SL army on 19/04/2009, in the waters of Nanthi Kadal lagoon where he lay hidden a whole night. He is now stoking the fires of hell along with Anton Balsingham, Pottu Amman, Thamil Chelvam Soosai and other war criminals. All is forgiven therefore for Karuna Amman and Pillayan for whatever sins they committed under duress from VP. It is God who is the ultimate judge. Repent and you shall be forgiven!